The Canberra Balloon Festival, part of this year's Enlighten Festival, was meant to be a joyous affair but, in reality, was far from it, writes Kay Turnbull. FOR OVER 20 YEARS, a flotilla of colourful hot air balloons has filled the sky over Canberra as part of the Canberra Balloon Festival. 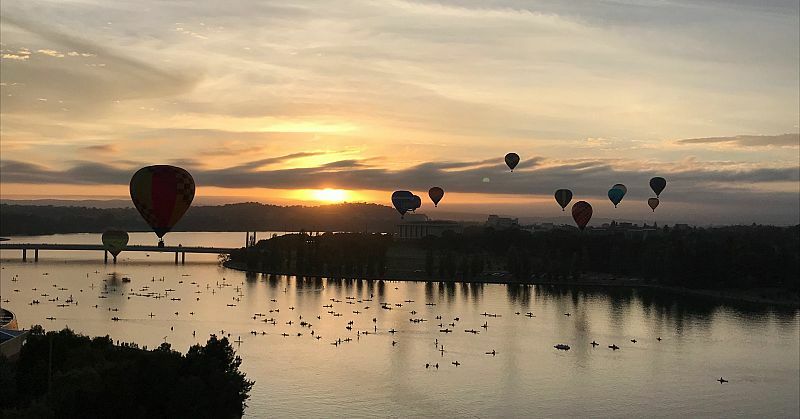 This year, the event was designated as an official part of the Enlighten Festival, and what followed was a tale so typically Canberra that we may well have seen the end of the Canberra Balloon Festival as we know and love it. In the interest of full disclosure, I am a hot air balloon pilot and have been flying my balloon over Canberra for over 20 years. The fact that my balloon was banned from this year’s festival due to potential offence was a telling sign of things to come, but has been discussed extensively elsewhere so will not form a substantial part of this review. It is important at this point to distinguish between the balloon flight director and committee (who were all amazing) and the external functionaries (who were not). From my experience, there are a number of factors that contribute to a successful event, whether that event be a balloon festival or a piss-up in a brewery. Chief among these factors is communication, followed by basic competence, empathy and a certain basic level of appreciation for the efforts of those who actually provide the entertainment. Few, if any, of these factors proved evident this year. From a communication point of view, the 2019 Canberra Festival was essentially an escape room, in that you had to fight tooth-and-nail for every bit of information, with crucial pieces of data released in the middle of the night, close enough to the event that participants barely had a chance to absorb the information, let alone offer any feedback. From a basic competence perspective, the balloon briefing tent was combined with the Lions Club breakfast tent, which I’m sure made sense from a cost perspective but meant that crucial briefings were held in a cloud of bacon smoke (not as nice as it sounds, I assure you). The flight director and meteorologist were forced to shout over the multitude of conversations happening mere feet away. After being informed that all crew would have to sign in and out of the event (an impractical request at best), the requirement was quietly dropped — but, of course, nobody informed the crew. At times, it seemed that someone in power was going out of their way to make anyone involved with the balloons feel like they weren’t welcome. A prime example of this was the welcome drinks session held on the launch field on Saturday night, hosted by local commercial operator Balloon Aloft. Around 15 minutes after the event started, we were confronted by unsmiling security guards, informing us that we weren’t allowed to drink in the area and instructing us to immediately move on. The situation became peak Canberra farce when security informed us we were fine to drink on the other side of a dirt road less than ten metres away — yet still solidly within the boundaries of the same park. Traditionally, the balloonists and crews (numbering around 120) are put up in accommodation together, which makes both the logistical and social aspects of the week much easier. In the past, the accommodation has been far from salubrious, but at least everyone was together. This year, crews were scattered across multiple venues, from the relatively luxurious to the earthy-but-charming to the borderline health hazard (where I was, obviously). Unsurprisingly at this point, we were only informed where we were staying two days prior to the start of the event, which meant nobody had a chance to make alternate arrangements. The culmination of the Enlighten event was the annual Skyfire fireworks display, sponsored as ever by local radio station Hit 104.7. During the event, a number of fireworks went astray, sending fiery projectiles hurtling towards onlookers. The A.C.T. Government immediately moved to distance themselves from any responsibility.